Marjoram, thyme, oregano, sage and spearmint got the advance treatment, while I’ll probably toss my basil seeds directly into their clay pots this week and perch them on a windowsill to sprout. 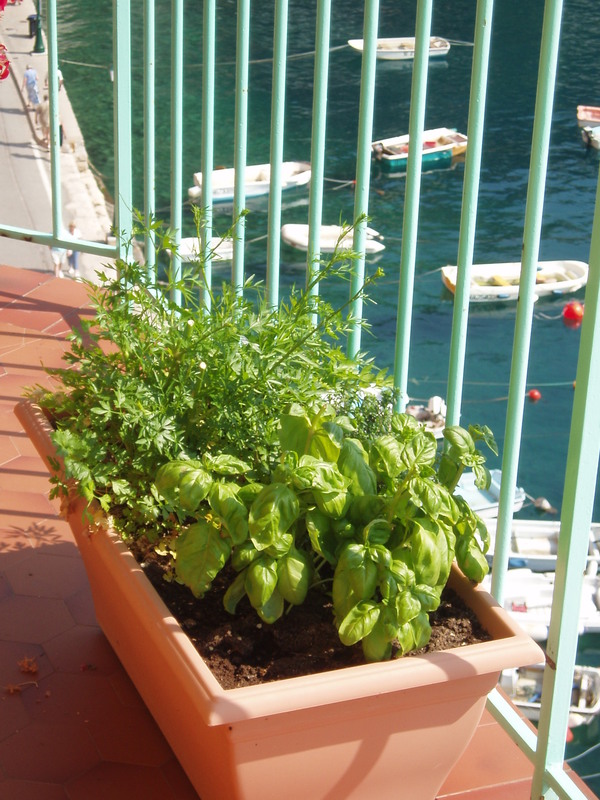 I have three varieties: sweet basil, Genovese basil and lime basil (a first for me). As for my dill, cilantro, parsley and chives, they’ll be sown outside later this month. If you don’t want to be bothered with starting your herbs from seed, just pick up your favorites in plantlet form from the local nursery, or even the grocery store. And trolling farmers markets can also lead to some great finds: A couple years back I discovered a chocolate mint and a cinnamon mint at the Chicago Farmers Market in Daley Plaza. 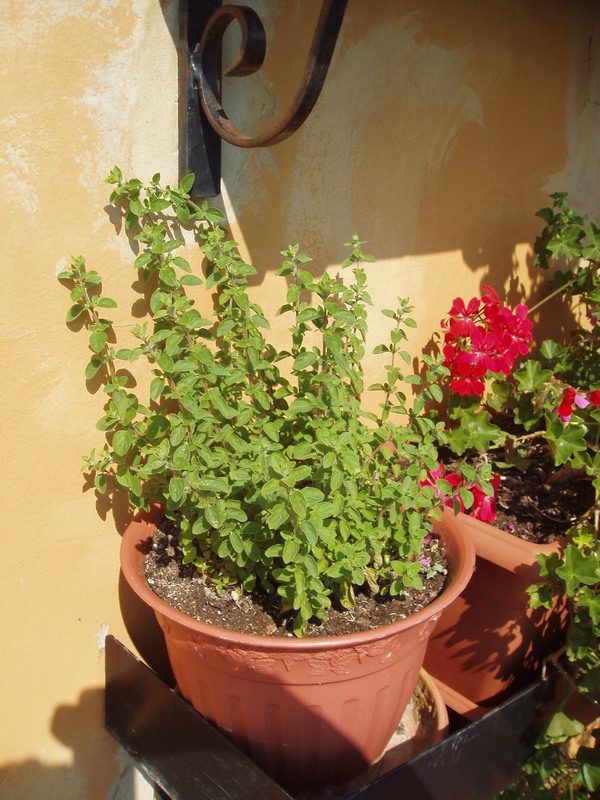 And from the anemic look of my spearmint seedlings so far, I may need to head there when it opens on May 14 in search of the mojito must have. Remember, herbs are a little thing that can make a big flavor difference when preparing your favorite recipes, and they really trumpet the arrival of summer. And, just maybe, they’ll put you in a Villefranche sur Mer penthouse state of mind. The rule I generally follow is “not before Mother’s Day.” This Sunday is supposed to be mid-50s to low-60s (F), so I think I’ll wait another week or so before setting my basil pot outside. Once I do it usually shoots up pretty quickly. I have all-day sun and a great southern exposure on my balcony. My herbs last into the fall and then I harvest heaps of basil and make pesto to gift my friends. The chocolate mint does have a slight hint of chocolate taste. I like to use it as a garnish and muddled in cocktails with a chocolate base. It also can be used for tea. B-t-w, I’ve visited Scotland (Edinburgh) in August and was wowed by its beauty. I hope to travel there again. I’m right there with you on the Caprese salad. It’s one of the reasons I grow so many heirloom cherry tomatoes. The lemon thyme for corn is a fantastic use! I didn’t plant lemon thyme seeds, just regular, but you’ve convinced me to go out and buy a plantlet so I can try your recipe. Thanks for the tip. don’t do anything to fancy , just add a couple of leaves of basil to tomato soup. I love tomato-basil soup, too, and it’s one soup that’s really easy to make from scratch but great with grilled cheese sandwiches. Do you make yours creamy? I like it to be mashed up as i run it in the liquidiser a couple of times. I must admit that I do not use herbs a lot. But I use coriander leaves or even onion stems to garnish steam or stir-fry fish. Btw, recently I get to know that we can plant Basil here. It a bit hard but it is possible. Have a wonderful day! Why is basil difficult there? I would think you would have a neverending supply because of the warm weather… Do give basil a try, I think you’ll like it. I use coriander leaves (cilantro), too, I make a couple different salsas with it — tomato and mango. What fish do you use it with? I’ll give that a shot, too. Actually, a mango salsa over top the fish would probably be great. LOVE the title of this post!!! Great fun to see what they’re doing in potted gardens in the south of France!